This article contains four brief examples of apps relevant to city planning. I wrote this article at the time of working on the OpenPlanning app prototype in Liverpool. Bürger baut Stadt (‘Citizens built city’) is a project based out of Berlin. In 2012, the project won funding at the “Stadt Land <code>” (“City Country <code>”) competition. The system scrapes data on development plans from the websites of Berlin’s 12 district administrations. The resulting map lists all development plans that are currently under consultation. In Germany, that is usually a period of four weeks. During this period, citizens can leave comments in writing or by email. Citizens can browse the map for development plans of interest to them, find the relevant link to the administration’s websites where official comments can be left. The platform offers the option to register for periodic updates by email of new development plans. Since 2014, its funders are actively involving in Open Knowledge Foundation’s German affiliate “Code für Deutschland” (“Code for Germany”). 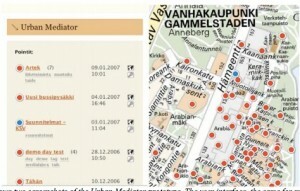 The urban mediator (UM) was an interactive system for the upload and sharing of information on a cartographic map. Its purpose was to “facilitate citizen-driven possibilities for action” by providing a venue where the expert information from planners and other institutional actors met informally user-driven content from the public (see reference). UM was developed as part of a wider EU-funded research initiative with partners in Helsinki and Dublin. The prototype was tested in Helsinki’s district of Arabianranta (Finland). UM offered various ways of inputting data — for example, users could contribute information from a mobile and it could be embedded in other websites as a widget. This option was useful for ’embedding’ UM in a particular context and facilitate already popular websites in a locality. The screenshots below are taken from Saad-Sulonen et al. (2007) and provide an impression of the early stage prototype version. At present, the future of the UM is undecided. It continues to remain accessible online but is no longer actively used. It nevertheless serves as inspiration for others. 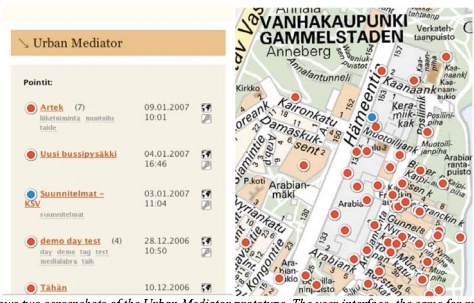 The makers of UM told me UM was superseded by a service called “Tell it on the map”, that the city of Helsinki developed and paid for on their own. Contrary to the UM, the Tell it on the map service limits the publics’ ability to start campaigns for participation and instead put municipal planners in charge of initiating them. Compared to Birmingham’s Civic Dashboard (see further down), which used a customer service centre’s data to visualise issues arising in the urban environment, the Open311 platform developed by Code for America is an advanced software tool that has since been open sourced. The Open311 platform aims to provide a standards-based API (“GeoReport” API) for mobile applications to tap into. Via its interface, the software enables citizens to post non-emergency queries online. Originally the Open311 Dashboard focused on issue tracking for potholes, damaged street light, vandalism. In the context of the SmartParticipation stream of the pan-European research initiative CitySDK, its functionalities will be expanded to include various city departments. The Open311 Dashboard could have the potential to augment civic engagement on planning matters if connected to platforms such as AllOurIdeas, which was employed by New York City to find suggestions for how to make the city a greener place. The Birmingham Civic Dashboard project was commissioned by Birmingham City Council, implemented by Mudlark, a design studio, and funded by Nesta is screenshots example of the novel use of data held by public authorities. According to Socitm, English local authorities receive 600m customer contacts each year. Based on Birmingham City Council’s contact centre, which handles public enquiries, the Birmingham Civic Dashboard took data on citizen’s queries and visualises those on a map. The Dashboard tapped directly into Birmingham City Council’s ‘contact centre database’, the customer relationship management system. To ensure data privacy, the system obfuscated the geographical locale of reported queries and filtered out some queries, such as complaints and compliments. 11 (45%) positive comments: Statements indicating approval with or without suggestions for future service improvements. 9 (38%) neutral comments: Statements without a valuing connotation (some statements were phrased as questions). 4 (17%) negative comments: Statements which included negative remarks, for example, saying the BCD was pointless or too limited to be useful. Some suggestions included the wish to see how a query was dealt with. Some comments called for improvements to the visual presentation to make it more useful, such as a more detailed map, ability to filter by time frame, and the option to cluster similar queries when zooming out of the map.